Softbound | 190 pp | size 8"x10"
This collection of 167 vector drawings, distilled from over two thousand pages of information published in the Blacksmith's Journal, provides scale line drawings of everything from tools & equipment to interior & exterior architectural items. 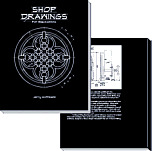 Shop Drawings for Blacksmiths is a design book that can also be used as a quick reference guide for project ideas and techniques by blacksmiths, fabricators, architects, and designers, or those simply interested in the art of blacksmithing. You probably don't have anything like it in your blacksmithing library. We think you'll find it to be a unique addition.